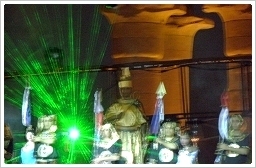 (13/02/11) From now on our news is available as RSS feed. If your browser is Mozilla Firefox or Opera subscribe to the posts as bookmarks by clicking this icon, if you use the Internet Explorer click the same icon in its menu bar. Yesterday, the international event "Egypt Moving Forward" took place in Luxor with a view to telling the world that Egypt hasn't lost to revolution but only gained by it. CNN, BBC, Reuters, and TV5, to name but a few, came to broadcast the message in English, French, Dutch, German, Italian, and Spanish. We hope that YOU got it, too! Conclusion: a completely successfull day with powerful presentations! In Egypt, there are, respectively were, 6 wild cats species: 1. The jungle cat, also called the swamp cat or the swamp lynx (Felis chaus nilotica) - it inhabits the reedbeds of the Nile Delta, 2. the African wildcat, also known as the desert cat (Felis silvestris lybica) - it is the ancestor of the domestic cat, 3. the sand cat, also referred to as the sand dune cat (Felis margarita) - it lives in very arid areas and, according to islamic tradition, the Prophet Muhammad and his daughter shall have been accompanied by it, 4. the caracal, also called the Egyptian Lynx (Caracal caracal) - its chief habitat is dry steppes and semideserts, 5. the cheetah (Acinonyx jubatus) - it is the fastest land animal, reaching speeds between 112 and 120 km/h, and is already extinct in Egypt. Ditto for 6. the leopard (Panthera pardus), which nowadays can be found only in sub-Saharan Africa. Egypt's wild cats are not just threatened by progressive habitat destruction as well as interbreeding with common domestic cats but also by game pits, toxic baits, sport hunting, and illegal trade. Their chance of survival could be that they are an important source of attraction for eco-tourism what becomes more and more popular in egypt. 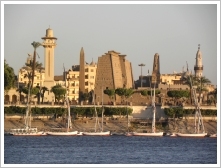 After the political unrest in Cairo at the beginning of this month many tourists left Egypt or altered their travel plannings for the next months. More than 2.5 million Egyptians who work in tourism are fearing for the future. The movement "Support Freedom, Visit Egypt!" was originated in order to ask you for your solidarity. We have been very happy in Egypt about all the demonstrations of solidarity in Europe, the United States and Canada during the revolution. Now, it's over and your solidarity is more in demand than ever. Support the Egyptian liberation movement, come to the new Egypt! Starting on February 20th all museums in Egypt will reopen. 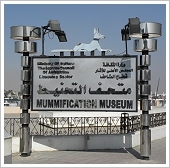 In Luxor, that regards the Luxor Museum of Ancient Egyptian Art and the Mummification Museum, both stand on the Corniche close to the River Nile..
Egypt Moving Forward invites you to join us for an exciting celebration of Egyptian life and culture as we welcome the world to the New Egypt. 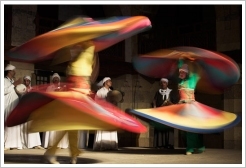 Egypt Moving Forward is celebrating culture and unity: coming together, embracing change, and welcoming the world. 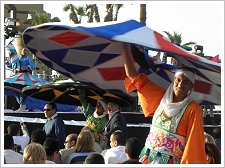 Egypt Moving Forward is a non-profit Egyptian and foreigner initiative committed to the future growth of Egypt. Today, Egypt is in the midst of new and exciting changes. 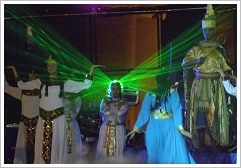 Egypt Moving Forward was founded to embrace these changes and showcase the best of what Egypt has to offer. Today, Egypt is making new history: a free future for the people. Today, the streets of Egypt are full of newfound liberty, happiness, and the warmth and hospitality the people are famous for. Freedom has brought new life to Egypt. 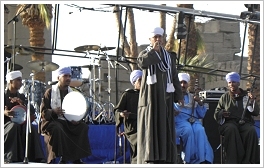 Introduction and Welcome from the Organizers • Sufi Dancing Performance • Mission Message: Dr. Abdel Halim Nur El-Din • Stick Dancing with Mezmar Musical Performance • Rababa Musical Performance and Folkloric Dance • Nubian Music and Dance Performance • British/Swedish Rock Band '13 Daze' Pass on! More good news: This week, Norway, Sweden, Denmark and Great Britain have eased their travel advice for Egypt. Yesterday, the British Foreign & Commonwealth Office published in bold print: "We no longer advise against all but-essential travel to Luxor." 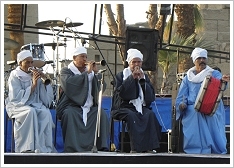 Thomas Cook, Thomson and First Choice announced that flights to Luxor would resume on February 23. Egyptair said that Cario International Airport is now working normally. Good news: Meanwhile, 3 of the missing exhibition pieces stolen from Egyptian Museum in Cairo during an uprising have been recovered. The restoration of several badly damaged objects is in progress. On February 16, 1923 - 88 years ago today - the burial chamber of KV62 was officially opened. Already on November 04, 1922 Howard Carter had found the steps leading to Tutankhamun's tomb in the Valley of the Kings. The tomb contained 5398 objects, the most popular is the golden mask of King Tutankhamun's mummy. While the mummy still rests in his sarcophagus in the tomb 3500 found pieces were brought to the Egyptian Museum in Cairo, 1500 of them are showcased. 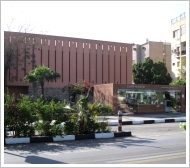 There, on January 28, 2011 during the Egyptian Revolution, many vitrines and exhibition pieces were damaged when looters broke into the museum, 8 pieces were stolen, including 2 gilded statues from Tutankhamun's treasury (see pictures below). Contrary to some reports, the famous golden mask is still intact and safe. Hitherto, the so-called Roman Capua leg dating to around 300 B.C. 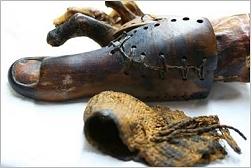 had been considered the earliest known practical prosthesis. Now, a researcher of the University of Manchester (GB) supplied evidence that two natural imitations of big toes found at the Theban Necropolis many years ago indeed acted as a substitute for amputated toes. Hawass suggested that ancient Egyptian embalmers just made every attempt to restore a complete body before burial. One of those imitations was found by Greville Chester and sold to the British Museum, London in 1881 where it's showcased and known as "Greville Chester Toe". The prosthesis is crafted in a type of papier mâché of linen soaked with animal glue and coated with tinted plaster in the shape of the right big toe and portion of the right foot. It was dated to before 600 B.C. 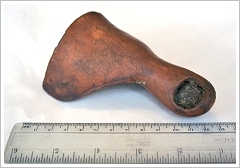 A second ancient Egyptian artificial big toe, again from the Theban Necropolis, was found in 2000, now in the Egyptian Museum, Cairo. 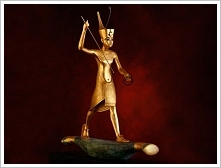 It was fastened onto the right foot of the mummy of a priest's daughter named Tabaketenmut who lived around 950 - 710 B.C. The two volunteers who tested out replicas of the artificial toes confirmed that they walked amazingly well with both artificial toes. The wooden toe provided more comfort (right picture), the cartonnage toe granted greater mobility (left picture). Source: Jacqueline Finch: The ancient origins of prosthetic medicine, in: The Lancet, vol. 377, issue 9765, 548-549 (335 KB). 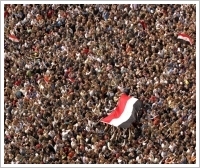 For eighteen days millions of Egyptians - young and old - men, women and children - Christians and Moslems - fought for democracy. Peacefully, solidarily, and tirelessly. Today, shortly after 6:00 p.m. local time their demands were fulfilled. The acting president Mohammed Husni Mubarak has resigned after nearly 30 years of regency. 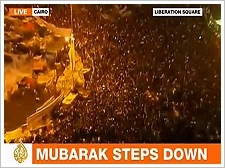 Hundreds of thousands of Egyptians are celebrating and jubilating with tears of joy! Since the 25th of January, a lot has happened what we never considered possible. Young Egyptians took to the streets in order to fight for freedom of speech, better wages and fair elections. By doing so they risked their neck. When looters wanted to take advantage of the situation, the villagers very quickly formed self-defence militias and controlled the accesses to the villages on the West Bank. The majority of Europeans residents who have lived here for quite a long time are staying. We feel protected. And touched by the sense of community and the prudence of the Egyptians. Compared to the pictures from Cairo going around the world it is quiet on Luxor's East Bank and West Bank. There is no curfew, the temples are open (and empty). 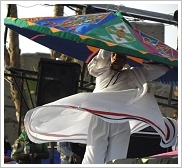 Many tourists who know Luxor for many years would like to come, however, the flights were stopped. If the justified claims for higher wages will be fulfilled, presumably, Egypt will not be any more that cheap country which has attracted so many tourists. But it will always be that country which is famous for its wealth of cultural treasures, its warm hospitality, and its guaranteed sun.